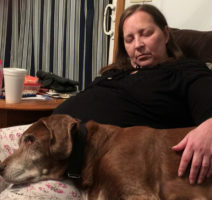 Sandy passed away at her home surrounded by her family, Saturday, January 26, 2019 in Otsego. She was born December 26, 1957 in Plainwell the daughter of Russell and Wanda (Horton) Fisher. Sandy had been a cheerleader and enjoyed playing softball as a young girl. Later she enjoyed body building and had competed in some competitions. She enjoyed woodworking and liked doing projects with her husband. Most of all Sandy loved spending time with her grandchildren. On December 22, 1988 at their home in Plainwell she married Dale Richards who survives. Also surviving are her children, Sarah Wooster of Kalamazoo, Kelly Wordon of Plainwell, Jesse Blanchard of Plainwell, Diana Stecker of Washington, Serih Kersey of Vicksburg, Charles Richards of Georgia, Elijah Richards of Muskegon and Enoch Richards of Allegan; many grandchildren and great-grandchildren; her mother, Wanda (Pete) Valler; father, Russ (Shirley) Fisher and her siblings, Brad Fisher and Shawn Gleason. She was preceded in death by her grandparents, Elden (Julia) Fisher Darl (Mabel) Horton. A celebration of Sandy’s life will be held at 1:00 P.M., Saturday, February 2, 2019 at the Otsego United Methodist Church. Burial of ashes will take place at Mountain Home Cemetery in the spring. Contributions in memory of Sandy may be made to St. Jude Children’s Research Hospital. To all of Sandy’s family, my heartfelt condolences and love. She was a fun and loving person.You will all be in our prayers and thoughts, I know you will miss her dearly and it will take a long time to learn to live with this.Love to you all. Our most sincere condolences to the entire Fisher, Blanchardand Richards families. Memories of Sandy will always be of her beautiful smile and happy heart! This saddens my heart. My thoughts and condolences are sent to you today. Love, support, and strengthen each other in this sad time. Praying that God will wrap His loving arms around your family and give you His strength and comfort. So sorry to hear this. I remember Sandy as such a sweet and nice girl in High School. My prayers to her family. Our hearts are broken for her entire family.She was a very special lady. Keeping all of you in our thoughts and prayers. Sending love and hugs to each one of you. My thoughts and prayers are with you. Much love to the family at this time. Dale and family: We are so sorry for your loss. She will be greatly missed by all. Sandy was well loved by all. She will be missed by all. My condolences to the whole family. I understand your loss. Remember the good memories and remember she is home with our Lord. Sending our condolences to the whole family. Sandy was a super lady. Sandy was in my class and she will be missed. Our thoughts are with Sandy’s family through this time of grief and transition. Brad and I are sending our condolences to you Dale and your Family. The news broke our hearts today. be yours as you continue life without her, and your hearts are full of memories of the beautiful person she was. Much love to all. My prayers and heartfelt thoughts are with all of you during this time of loss. I remember Sandy in school always having a beautiful smile and kind words for everyone, she was a lovely soul and will surely shine in heaven. I am so sorry for your loss Dan. I will keep you and you and your family in my prayers. Sorry for all of your loss. Sandy had an infectious smile that will stick with us forever! Sending you all love and prayers at this sad time and I hope you can feel the love and support surrounding you with each kind word and kind gesture. Sandy held a special place in many hearts and that is something special for you all to hold dear. May all of those loving memories help to ease your sorrow. Love and prayers for you Sarah, and the rest of your family. You are all in our thoughts and prayers. Hang tight with one another. It was our honor to know Sandy. The 1st thing I noticed the 1st time we met was her smile. She will be greatly missed. Our deepest sympathy to entire family. We have been blessed that Dale and Sandy belong to our church family at River of Life. Knowing she has gone to her heavenly home bring us great joy for her, but we mourn our loss here on Earth. Prayers for the family during this difficult season of greiving. My deepest sympathies are being sent to Sandy’s entire family. Praying God blesses each of you with the comfort and strength you will need to get through this difficult time. May your hearts be filled with all the beautiful memories you have of Sandy and that they help bring all of you peace. God Bless each of you. Our thoughts are with you all. Robin and I were reflecting upon the days when we encountered Sandy and Dale; almost always associated with wrestling or school. We feel that we were fortunate to have known Sandy prior to her battle with illness but we really had no interactions during the years she was ill. Therefore, we have only fond memories of Sandy at her best…when she was enjoying watching and supporting those that she loved. Dale, as a care provider I am sure much of your time has been consumed with doctors visits, providing comfort and coping for Sandy. You will be in our prayers as you now cope with the adjustment of taking care of yourself. We hope for Jesse and the rest of you that you find some solace in the fact that so many of us are out here to help memorialize the fond memories. And Grace, Kate (Job) wants me to add that she extends to you her sympathy.